Learning analytics has been focused on students and their contexts for functions of proficiency and optimizing learning and the environments in which it occurs. A description of the curriculum framework is accompanied by way of a discussion of the challenges to be handled as a part of this chapter. With greater than a million college and university students and thousands of instructors, the usage of the curriculum, a large and rich dataset, is continuously updated. This repository depicts teacher and students utilization and offers thrilling possibilities to leverage records to enhance coaching and studying. 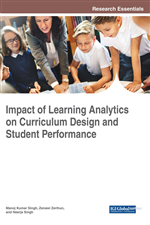 In this chapter, the author includes a studying analytics framework for designing curriculum. Classroom instructors normally use established lesson plans to organize their teaching as well as proportion teaching practices with friends and mentors. However, based lesson plans also can be utilized by instructors to research, reflect on, and with any chance improve their teaching layout, before they deliver it to their students. Teaching Analytics refers back to the strategies and mechanism that purpose to help this procedure of development. There are many gadgets now a day’s providing new mechanism to help out studying, each inside and outside the classroom. This improvement, in flip, has created new possibilities to recognize and examine their effect on educators and learners through the collection and evaluation of consumer interplay statistics. Indeed, a prime benefit of on line curricula over conventional textbook‐based curricula is the capacity to seize that person interplay or learning analytics information. Learning analytics is a noticeably new, however unexpectedly developing area of studies whose purpose, in step with the Society of Learning Analytics, is “understanding and optimizing learning and the environments in which it takes place.” Most learning analytics strategies use data generated via the interactions among rookies and the Learning Management Systems. Ongoing studies in instructional information mining and learning analytics suggests that harnessing analytics statistics can enhance new studies methodologies in schooling, help educators higher check their pedagogical practices, and devise modern instructional strategies, all with the purpose of enhancing schooling. Learning analytics can leverage improvement via improved instructional choice‐making,clearer institutional and character intention setting (Hendricks, Plantz,& Pritchard, 2008), greater well timed and frequent remarks for students and teachers and the technology of a richer set of records on student behaviour and getting to know. With the unexpectedly developing hobby in and technical potential to leverage these data in instructional settings, there is also a growing feel that many recent educational technology and big information tasks are detached from what we understand approximately teaching and learning. While the usage of Learning Analytics has been mainly fruitful in better education and in on line guides where many to all getting to know activities and interactions take place on line, in traditional brick and mortar colleges, it stays important to contain facts derived from the opposite sports that move on in a classroom with the intention to capture completely the kind of getting to know studies taking place. This is mainly important in science training in which most professionals agree that scholars need to be “doing” technological know-how: accomplishing experiments, making observations, and building. Without facts on fingers‐on activities and classroom discussions, it may be difficult to make feel of the Learning Analytics records amassed with the aid of an LMS. It is, therefore, vital to ensure that using Learning Analytics in applicable pedagogies and serves as a complement to statistics on face‐ to‐face interactive studying reports not captured with the aid of digital artifacts which includes student inquiry, lecture room discussions, and hands‐on activities. This comprehensive, blended methods technique guarantees that records analyses in Learning Analytics are not reduced to the mere evaluation of clicks and page visits. However, Learning Analytics ought to be leveraged in ways that each recognizes. While Learning Analytics has an established presence inside the commercial enterprise quarter or even in better education. Although there may be not anything incorrect with those drivers, educators are not likely to shop for into new technology and large statistics projects if they're not without delay on hand and applicable to their every day works . How can we include the Learning Analytics information into a broader effort to apprehend how a virtual curriculum is used? How can we leverage the Learning Analytics statistics to aid teachers and administrators? Three. How can we combine the Learning Analytics facts into the assessment of the curriculum’s effect?